It’s no stretch to say that Jon Langford is one of the great populists/raconteurs of our time—friend to the common man, voice to the voiceless. And while some of his projects have possessed varying degrees of sonic “punkness” (the Mekons and the insurgent country stylings of the Waco Brothers, namely; but also the Pine Valley Cosmonauts, the Killer Shrews and various solo collabs), they’ve all been imbued with Langford’s restless, righteous lefty spirit. Old Devils, Langford’s first solo record proper since 2006’s excellent Gold Brick, may not be top-shelf Langford, but neither does it find our hero mellowing in old age. 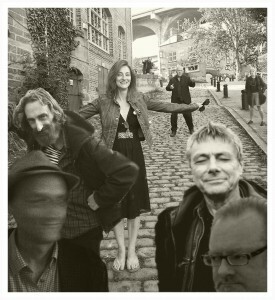 No lion in winter, Old Devils is an enjoyable addition to a vital artists’ eminent discography. With some friends both old—the Mekons’ Sally Timms, fellow Waco Bros Alan Doughty and Joe Camarillo—and new (though chronologically old)—blues/funk sage Andre Williams—Langford peels back the façade on 21st century America. The ringing “Getting Used to Uselessness” finds a lonely narrator wishing he had accrued more than power over his life; “Self Portrait” and “Luxury”, funky and folky, respectively, acknowledge the power of personal and cultural delusions. Heady stuff, but you can definitely tap your toes to them—thank Doughty’s elastic basslines for that. Meanwhile, “Book of Your Life” is a perfectly acceptable addition to the subgenre of book-as-life metaphor songs, notable for Sally Timms’ ethereal voice and Jean Cook’s sharp violin. Langford has kept his pointed lyrical barbs sharp all these years throughout his discography, and Old Devils is no exception. “Death Valley Day” sums up the Welsh Langford’s adopted homeland in one damning couplet: “This house is full of stuff / Don’t you think we’ve got enough?” And I’m still wrestling with how to interpret the title track’s assertion that “we believe with out reason / that there’s nothing to believe in anymore”—is it the sigh of a man giving up or the last angry man’s disbelief in his countrymen? Given that the closing track muses on the “strange ways to win wars,” here’s hoping it’s the latter interpretation. Langford’s looking ahead (or at least at the present), but he’s always held his music up to the past as well. (This is a man who, with the Mekons, covered “Trimdon Grange Explosion,” after all.) “Pieces of the Past”, a lesson about, among other things, Caribbean pirate Henry Morgan and the whitewashing of history (“pieces of the past are safe to handle at last”)—and narrated by Andre Williams, no less!—could’ve been a Gold Brick holdover, given its epic content and scope. The song feels a little big for Old Devils, though, a suspicion that is confirmed when a noisy coda signals the inevitable uncorking of messy history. Too, the fascist-mocking “Flag of Triumph” could be an outtake from the Wacos’ Bush II-lament Freedom and Weep. All told, it’s not so much that Langford is repeating himself on this record, as it is a case of not being able to teach an Old Devil new tricks. Cough. 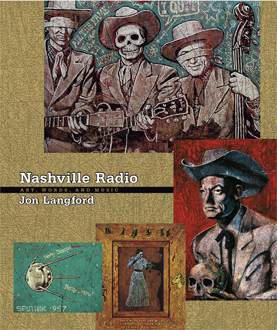 At this point Jon Langford – founding member of the Mekons, Waco Brothers and Pine Valley Cosmonauts and pioneer of “folk as punk, punk as folk”aesthetic – is essentially Americana’s cool uncle, sweeping through town once a year , regaling you with tales of far flung ports of and seedy characters. And like that cool uncle he’ll take jabs at your square parents’ suburban mediocrity and inarticulately presented, dearly held conservative values with a wit and vigor that would cause family friction if he weren’t a troubadour, an artist and a poet (and on his way to the next gig).Old Devils finds Langford and his frequent collaborators, Al Doughty, Joe Camarillo and Jim Elkington going what Langford does best – exploring the haggard landscape of post-modern, post-colonial Western culture while plowing through the best parts of rock, country and their off-shoots. At this point – after thirty odd years of creating art that is always uniquely satisfying – it’s easy to take Langford’s knack for a well crafted lyric and an effortless hook for granted, but tracks like “Getting Used to Uselessness,” “Luxury” and “A Strange Way to Win Wars” are great reminder of why you can’t wait for his yearly visit. Because ill fitting comparisons are the soul of bad criticism, Jon Langford’s probably been saddled with his share of well meaning but off base comparisons: To Billy Bragg. To Ted Leo. To The Hold Steady’s Craig Finn. To Frank Turner. They’re all well meaning and kind of accurate if you step back, squinch up your ears and don’t listen too hard, but not really on the ball. To really appreciate Langford, you have to flush all those silly little comparisons down the drain and focus on his ability to really rock a song out.. With Old Devils, Langford joins up with Skull Orchard to get to the meat of a bunch of rock’n’roll traditions. Those traditions — as a socially aware singer/songwriter and as a rock troubadour — are, of course, employed by a lot of his contemporaries, but Langford’s ready to do them proud on his own. At his heart, Langford’s a rocker with so much soul he doesn’t seem to know how to manage it. Sometimes, it comes bubbling out in bitter remorse (“Strange Way to Win a War”), other times it’s a little more soul searching as he struggles to make sense of dark days (“Getting Used to Uselessness”). Most of the time, though, he’s as spirited as we’ve seen him in a while, as he touches on everything from alt-country to punk to classic rock to folk. Instead of forcing them together for some rickety mix’n’match kind of hybrid, though, Langford taps into their inner workings, connecting those elusive parts that make a rock tune touch you or an acoustic ballad move you. Once again, it comes down to soul. Compare Langford to whomever suits your fancy. That’s not as important as knowing this Welsh transplant is the real deal. You should have probably already guessed that, though: All those forced comparisons have a way of aligning Langford with some of rock’s best. That, at least, is pretty accurate. If the No Depression community had it’s own Hall of Fame I’d be shouting from the rooftops for one particular nominee from these shores to be in the inaugural honours list that would be Jon Langford ,there’s no doubt in my mind that the former drummer and guitarist with punk band The Mekons is more than deserving of greater recognition. With The Mekons Langford released an distinctly British indie cow-punk album Fear & Whiskey (Pitchfork , Popmatters, eMusic ) that is still as vital as it was on release back in ’85, after upping sticks and leaving the UK to relocate in Chicago in ’92 Langford became a founder member of The Waco Brothers and mainstay of The Pine Valley Cosmonauts with numerous other collaborations and album guest appearances with fellow musicians including The Sadies, John Hiatt and Alejandro Escovedo, his wonderful art, a radio show and visual arts performances you’d be forgiven for thinking there was more than one Jon Langford. His latest musical project is released on Bloodshot later this month, teaming up with fellow Waco Brothers stalwarts Alan Doughty (bass) and Joe Camarillo (drums) along with Jim Elkington (guitar) – collectively Skull Orchard (the name borrowed from Langford’s début solo album from 1998) the album Old Devils features 12 original tunes that leave no doubt that Langford’s a master at the mix and match of punk ethos, indie sensibilities and roots thematics, a really engaging album that refuses to be categorised and stands as another original piece of art from the prolific Mr Langford. For those of us with functioning turntables the added the good news is in addition to the CD release the album gets a limited edition vinyl issue, this will include two extra tracks, bonus artwork (you know it’s going to be good) and a download of the album too of course. When Joe Strummer died, a piece of him stayed behind inside of Jon Langford. Langford, a Welsh singer-songwriter, is one of the rare examples of a drummer (as part of the seminal punk band The Mekons) who was able to transform into a guitar-playing bandleader. 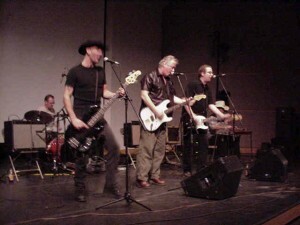 Like Strummer, he infused his raw, energetic, and unrehearsed punk sensibility with elements of country and folk, playing with bands like Waco Brothers and Three Johns (with John Hyatt) before forming the Skull Orchard band. There are few artists today whose albums I instantly take to as strongly as Langford, and his 2010 release, “Old Devils,” is no exception. Simple rock and roll/punk/country tunes about love, loss and pain played with a terrific band (fellow Waco Brothers Alan Doughty and Joe Camarillo on bass and drums respectively and the Zincs/Horse’s Ha dapper, finger-picking Englishman Jim Elkington on guitar). I’ve listened to this album straight through half a dozen times already. If this isn’t one of the best albums of the year, then we’re in for a great second half of 2010.